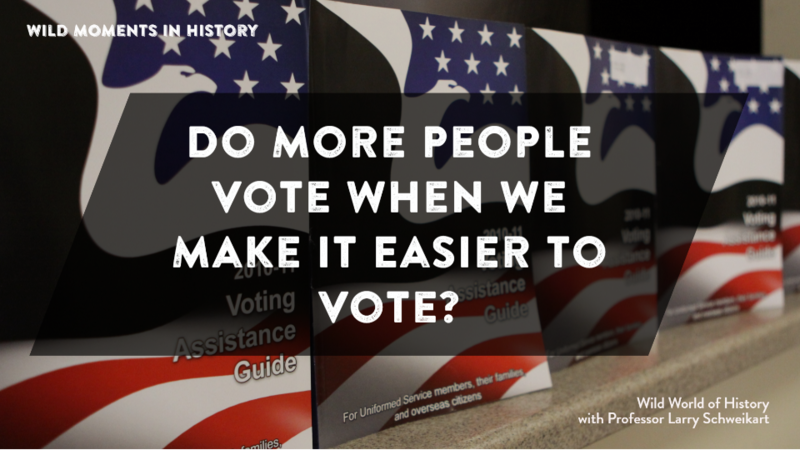 Do More People Vote When We Make it Easier to Vote? Did you know that making it easier to vote actually decreased the number of voters who participated in elections? In the early Republic, Massachusetts, New Hampshire, New Jersey, Maryland, North Carolina, and Georgia all required males to own property or land to be eligible to vote for the lower house in the legislature. Ten states required land ownership or a “freehold” to vote in the upper house. Nine states had property requirements for voting in their constitutions. As of 1780, more than 70% of New Hampshire males held met the requirement as did 72% of Rhode Islanders, 61% of Delaware men, and 85% of Pennsylvania males. Voter turnout in the 13 founding states averaged between 48% and 65% between 1776 and 1780. As late as 1819, historian Richard McCormick found that 97% of those eligible to vote actually cast a ballot, compared to the period 1952-1960 when the turnout of registered voters was 85% and only 87% of those eligible had registered, and of all adults, only 86% were eligible. By 2016, the number of eligible voters who voted was just under 60%—up slightly from 2012 (58.6%) and up considerably from 2000 (54.2%). It appears, then, that having strict requirements on who was able to vote increased the number of eligible people who did vote. Richard P. McCormick, “New Perspectives on Jacksonian Politics,” American Historical Review, 63 (October 1959-July 1960).